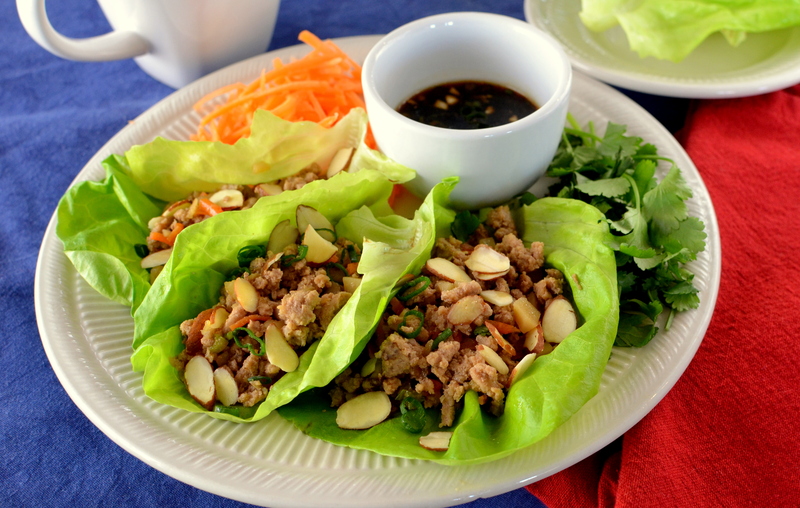 These lettuce wraps are gluten free, as well as low carb, and fairly good for you. You can even substitute the gluten free soy (or tamari) for a low sodium one, if you want to cut back on salt. Mix together your GF soy, rice vinegar, agave, and sesame oil in bowl. Set aside. Cook the turkey in saucepan until almost browned. Pour out extra liquid. Add in carrots, mushrooms, water chestnuts, garlic, green onions, ginger and the sauce mixture. Mix together well and let simmer a few minutes. Mix cornstarch with a few teaspoons of hot water and mix. Add to saucepan. Continue to let simmer another 5 minutes, or until vegetables are softened. Remove from heat. The longer you let it rest, the better the flavor becomes. Mix all ingredients together and whisk. Divide into smaller ramekins or bowls for dipping. 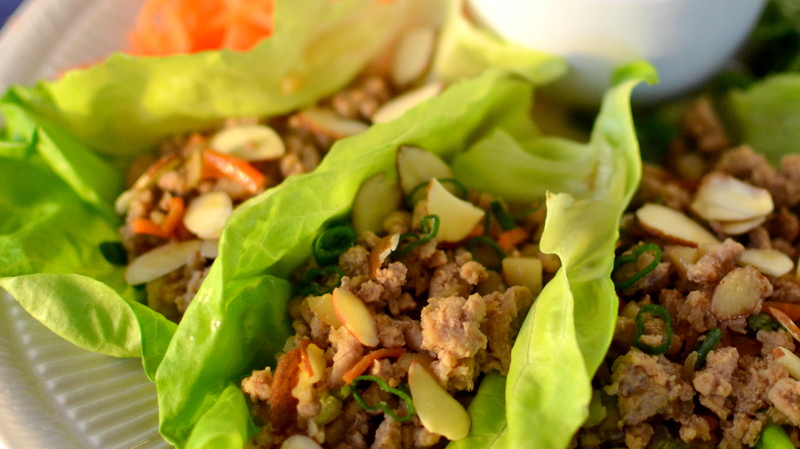 Spoon a few Tablespoons of lettuce wrap mixture into individual leaves of lettuce. Top with raw shredded carrot, sliced almond, and cilantro. Dip into sauce and enjoy! 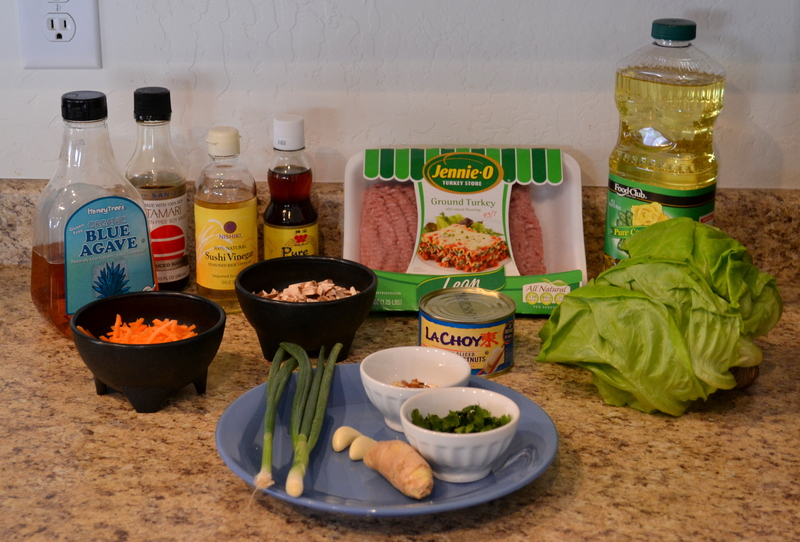 This entry was posted in Asian and tagged Asian lettuce wrap, celiac, gluten free blog, gluten intolerance, gluten-free, how to make lettuce wrap, lettuce wraps, low carb, PF Changs lettuce wrap, recipes, Thai lettuce wraps. Made these for the family on Sunday. They were a big hit. Delicious. A lot of work but well worth it. Thanks for sharing. We had our after school kids make these to share with their culinary adventure groups. It was a sight to watch and experience. Ages 12-18 sharing “power of knowledge” + eating healthy choices. Hi I'm Crysty! Thanks for stopping by! Check out all of my awesome gluten free recipes! The best tostada you’ll ever eat! Ain’t no party like a Queso Fundido party!